Next Batch: Due on the 30/05/2019. Delivery to customers within 10 working days of the 30th. Stylish design with a clean matt white finish. The under-bed provides a large storage area or a guest bed. 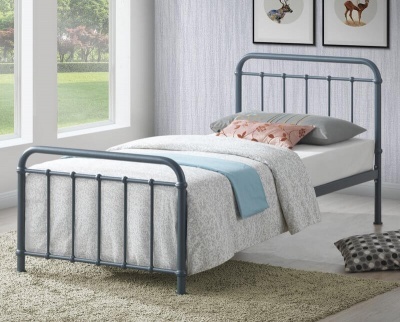 Ideal for guest and children's bedrooms. Handy shelving at the back of the bed frame offers you additional storage and display space. Fits UK standard single mattresses. Available as the daybed with under-bed only or with the Cabin or Platinum mattresses. Cabin mattress: H15 W91.5 D190 cm. A stitch quilted mattress with an oyster damask ticking cover. Made in the UK. Low profile 13.5 gauge Bonnell spring unit, plastic side edge supports, 900 gsm spring insulator pad, 270 gsm polyster filing. Platinum mattress: H18 W91.5 D190 cm. A medium-firm mattress with a low profile construction. Made in the UK. Low profile 13.5 gauge bonell spring unit, rod edge supports, 900 gsm spring insulator, 500 gsm polyester filing, Belgium damask quilted cover, quilted border. Made from coated particleboard with melamine edging.